How, why, and what these artists notate can vary substantially. 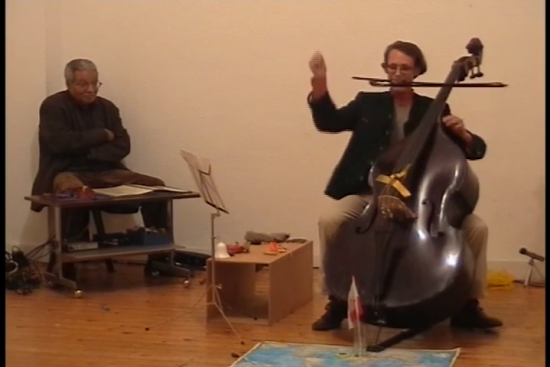 Some transmit aspects of their own practice as improvisers (Malcolm Goldstein); some develop it privately (Derek Bailey – see Lash 2011); and others agitate their ensembles (Misha Mengelberg – see Schuiling 2016 and and Whitehead 1998). Some luxuriate in the gray area between the written and the improvised (Bob Ostertag), and others inscribe a gap (see Richard Barrett’s Blattwerk (2002) or my Apples are Basic (2008)). But in all these cases, the matter of what gets notated is nearly always intertwined with ongoing improvisational practice. The present chapter aims to articulate the dynamics of this intertwining – the process of inscription. It centers on the following question: how do composer-improvisers use notation to share, challenge, or transform their own ways of improvising? 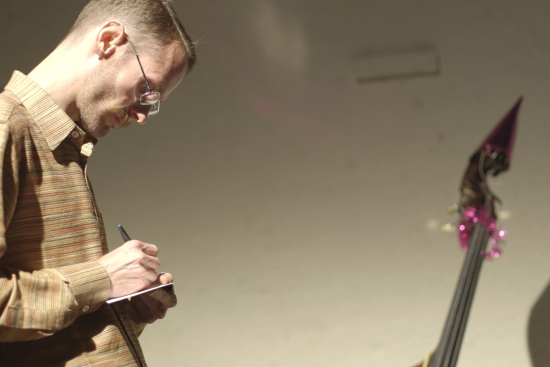 By tracing my study, preparation, and multiple performances of Ben Patterson’s Variations for Double-Bass, I will flesh out a deceptively straightforward answer: notation for improvisers entextualizes the ongoing improvisatory practices of its composers and/or performers. Borrowing from anthropologist Karin Barber, who, after Michael Silverstein and Greg Urban (1996), defines entextualization as “the ‘process of rendering a given instance of discourse as text, detachable from its local context'” (Barber 2007, 30), I will pursue two related claims: (1) notation in this piece emerges from and feeds back on improvisation, rather than simply generating or freezing it, and (2) improvisation in this piece is a continuous thread throughout processes of score-making, preparing and rehearsing, and revision after performance – above and beyond its most obvious manifestation in concert performance. Variations offers a unique opportunity to address these issues, as it foregrounds aspects of inscription, preparation, and revision that are often too private or ephemeral to trace in other scores for improvisers. 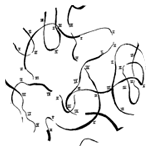 I first learned about Ben Patterson’s Variations for Double-Bass in Fluxus2 catalogs and histories – the piece has something of a legendary aura around it. Composer and experimental music scholar George E. Lewis describes it as going “well beyond any previous notion of extended technique then in force in the world of contemporary classical music” (2014, 95); elsewhere it is referred to, along with other early pieces by Patterson such as Paper Piece (Stegmayer 2012, 59-61), as a historical contribution to black performance art.3 It was premiered at Mary Bauermeister’s Cologne salon in 1961, subsequently performed at the famous Wiesbaden Fluxus exhibition of 19624, and is now considered by most scholars and enthusiasts to be a Fluxus classic. So it was with some surprise that my request to Patterson for a score in 2001 was answered with an unceremonious thicket of typewritten text, handwritten comments, unexplained Xs and arrows, cut and pasted fragments from Verdi’s Rigoletto, editorial scribbles, and photographs from an early performance. Its provenance was Patterson’s Black and White File (1999), a “working file” (Patterson 1999, “Overview”) of the composer’s scores from 1960-1999. Unpaginated and bound in a simple two-ring binder of the type used by Germans for the most banal of record-keeping, the seventeen Variations are unassumingly sandwiched between Duo (1961), for voice and string instrument, and Paper Piece (1960), for an unspecified number of performers playing (with) paper. The humble presentation of this Do-It-Yourself collection stands in marked contrast to scores by many of Patterson’s Fluxus contemporaries such as George Brecht’s Water Yam (1963) or the La Monte Young-edited volume An Anthology of Chance Operations (1963). Compared with these Fluxus archetypes, both meticulously designed and packaged by the movement’s spokesman George Maciunas, Variations seems more like a leaky sketch than a polished, autonomous art object. Its informality is emphasized by its distribution history: from 1999 to 2012, Patterson produced copies of the Black and White File to order and often gave them away for free, up until his scores were published together in an anthology edited by Benedikt Stegmayer (2012). Having performed Variations on several occasions, I can attest that the principle value of Patterson’s notation is indeed personal and reflective; one discovers this both in and en route to concert performance. However whereas Patterson implies that Variations’ notation “on paper” is simply a means to an end – prescribing and preserving the piece for performance – my own experience playing the piece has revealed that the score is something more. In addition to providing the performer a set of instructions or generative conditions for performance, it is also itself performative, and the nature of that performance – always shifting, contingent, and reflective – might be best termed improvisation. Explaining the performative, improvisational nature of Variations’ notation – as well as that of most notation for improvisers – can benefit from the notion of entextualization. A brief historical contextualization of the term suggests why. Given only textual and performative perspectives, the study of notation for improvisers, and a piece such as Variations, is thus caught between a rock and a hard place. On the one hand it challenges old-fashioned views that privilege the score at the expense of contingency. On the other it challenges the efforts of scholars such as McMullen and Borgo to develop dynamic and inclusive models of improvisation by leaving the score behind. Entextualization, which focuses on “the process of rendering” (Barber 2007, 30) texts rather than on the internal structure of finished objects, offers a solution to this bind by providing a middle way between two totalizing poles. It allows us to concentrate on articulating “given instances of discourse” – concrete moments of practice – “from the bottom up” (31). It also helps us to see how notation promotes growth in the improvised discourses from which they arise. I would like to begin by considering Variations in a scriptocentric light, according to the prescription-preservation model I set out to rethink in Chapter 0 (“Context and Literature Overview”). Doing so will allow allow me to show how this view, while initially helpful for purposes of orienting the performer, breaks down in practice under internal inconsistencies, or “leaks” to what lies “outside” the score, and requires a more flexible view for the performer to find a coherent way forward. I. unfold world map on floor. circle with pen, pencil, etc. city in which performance is being given. locate end pin of bass in circle. 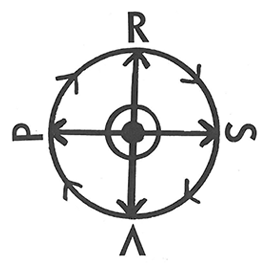 Locate north and align with compass. affix with tape. display local flag. To the upper left of the instructions, there is a handwritten x with a circle around it, and just to its lower left, the word “map”. These markings, like “bird calls”, written to the lower left of Variation II, seem to be practical markups that Patterson made to remind himself of the content of these particular variations when performing them. Such notes would have saved him the trouble of searching through the fine print, much in the same way that a downward-facing letter “E” would remind an orchestral performer to put on her mute, or a circled forte would remind her of a dynamic shift. Moving on to page 2, I find the handwritten word “(Tuning)” at the end of the typewritten instruction in Variation III (“produce a number of arco, quasi-webern sounds.”). Unlike the handwritten addendum to Variation I, the instruction to which “(Tuning)” refers is ambiguous, for I would have already tuned in Variation II (“using four different toy whistles, animal or bird imitators or calls, etc. tune strings of bass as well as possible” (my italics)). It would not make much sense to tune the bass in two successive variations; does this mean that Variation III is an ending to Variation II, to be performed attacca? Or perhaps this is simply a kind of practical markup, like “map” in Variation I, that Patterson used to remind himself to perform it this way on a particular occasion? Below the verbal instructions in Variation III appears a fragment from Verdi’s Rigoletto inserted into the score. 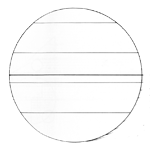 The crooked horizontal line below the second staff suggests that it was cut and pasted on top of the typewritten layer, producing a photocopied shadow. Despite the fragment’s temporary, haphazard appearance, performing it presents no practical complications per se. Like the addendum to Variation I, I can play it as is. Subsequent appearances of Rigoletto, however, are more complicated to interpret. Such is the case in Variation IV, where it appears in handwritten rhythms with accidentals, but without staff lines or any supplementary information about how it should be played. It seems to be pasted over a fully notated version on staff lines, remnants of which can be seen to the lower left of the variation; possibly fixed pitches were eliminated because the melody should be played with the clothespin preparations specified in the first half of the variation, which change the pitch of the strings unpredictably. In an effort to find similar cases elsewhere in the score that might elucidate Variation IV, I compare this instance of the fragment with a similar one in Variation XIV, also handwritten with rhythms and accidentals but no staff lines, except those underneath the cut and pasted overlay. But Variation XIV is equally cryptic; no more information is given than in Variation IV. Adding to the mystery, the accidentals in Variation XIV do not correspond to those in Variation IV, which are identical to the accidentals in the fully notated version of Variation III. More questions are raised than answered here – should the Rigoletto of Variation XIV be played in a different key than the others, and if so, which one? And what of the numerous verbal instructions to play Rigoletto I find throughout the score such as “Rigoletto” in V and IX, “pizzicato Rigoletto full” in X, or “Rigoletto rhythm” in XII? Returning to Variation IV, I find another leak. Specifying a string preparation, the handwritten indication “above & below bridge” lies above the hand-underlined phrase “plastic spring-type clothespins”. On the very next line “several inches” is scratched out and substituted with the handwritten word “just”, followed by “above bridge”. These instructions contradict each other; can I presume that Patterson placed the preparations differently on different occasions, and I might do the same? In this case, Patterson’s indication that the clothespins “rattle and/or produce odd tones” provides the framework for an informed choice; I thus treat this inconsistency as permission to place the clothespins at either location, at whatever distance to the bridge works for me and my instrument. Unfortunately notational confusion of this sort can not always be resolved in context; sometimes contradictions or unclarities handicap my understanding of the basic instructions. For instance in the first part of Variation IV, I encounter an arrow pointing from the first line (“place a number of wooden and plastic spring-type clothespins”) to measure 6 of the first appearance of the Rigoletto fragment in Variation III. Does this mean that the clothespins should be applied to the strings during the melody? Later in Variation IX, I find three different modifications of the same excerpt: “Whistles”, “Accordion bird”, and “Trumpet or sax”. Written in three different pen-widths, and thus presumably at different times, these comments suggest the melody could be played on any of these instruments. Could I also play it on another? Variation X is another such example. Its original typewritten instructions to “perform pianissimo, medium and short tones arco with mute” are faintly scratched out; above is written “Parrot on string”, “Stop Rigoletto” (crossed out), and below the line “pizzicato Rigoletto full”. In comparison to the relatively minor effects of notational unclarity on the clothespin preparations, Variation X’s problems are significant; completely different actions are described. The question is not merely how but what the performer is actually supposed to do here. It is worth pointing out these problems’ close connection to the medium of handwriting, and to Patterson’s engagement with the materiality of the score more generally. The presence of multiple edits in the same document, for example, is a direct consequence of working with pen and paper. Had he edited Variation X with Word, new markings such as “Parrot on string” would have simply replaced previous ones; “perform pianissimo, medium and short tones arco with mute” and “Stop Rigoletto” would have disappeared without a trace. Likewise, inserting the Rigoletto fragments with Photoshop, as opposed to manually cutting and pasting, would not have created photocopied shadows. Doing so would have resulted in a tidier appearance, but the temporality of the insertion – i.e. an index of change to the original typewritten version of the score – would have been obscured. For better or worse, handwriting and work with the physical medium of notation – which we find in the vast majority of pieces included in Tactile Paths – is increasingly rare in the world of contemporary music performance. Contemporary musicians typically work from scores antiseptically typeset in notation software and/or word processing programs, usually prepared by the composer and untouched by other performers.5 This workflow has obvious benefits: it eliminates ambiguity between classes of notational symbols; makes revising a quick and simple matter; bypasses the cost and potential for mistakes associated with hiring a copyist; and reduces the time required of performers to access content. In sum, it minimizes resistance to the cutthroat pace of underfunded preparation and rehearsal which is symptomatic of our times. However this workflow also reinforces the prescription-preservation model of the score by prioritizing the consistency of notational objects. It eliminates or marginalizes artifacts of the process of inscription that might complicate the clean flow of information from composer to performer. 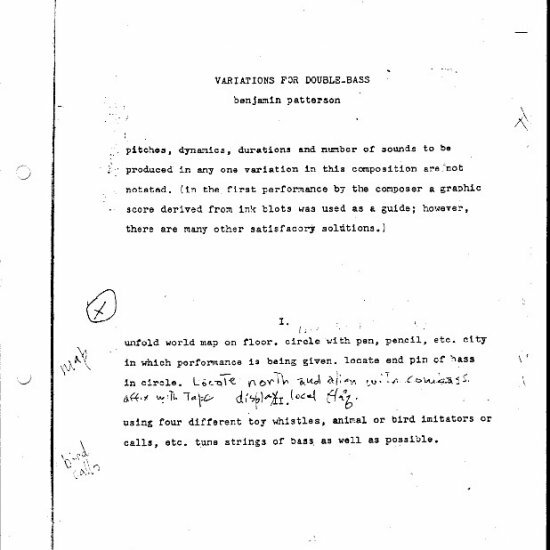 Handwritten edits or manual cut-and-paste inserts are seen as sloppy; conflicting performative indications are less likely to be digested.6 For this reason, Patterson’s jumble of annotations is more likely to paralyze than to animate the average contemporary music performer whose scriptocentric view I have expressed in the previous paragraphs. But even from the scriptocentric standpoint, Variations’ “inconsistencies” must be important. Given the fact that Patterson did nothing to resolve this quagmire when he published the piece, one would even have reason to believe that it constitutes an intentional strategy. Otherwise, why would he have sent me this score in the first place? He could have just as easily sent me an unedited typewritten copy. This points to a more fundamental incompatibility between Variations and the hard textual view: Patterson’s frequent changes to the manuscript arguably render it too mobile, too distributed to consider it a single, finished text at all. Variations shares this characteristic with much music of the pre-modern era, including scores of the Ars Subtilior with whose notation scribes frequently “experimented” (see Stoessel 2013); the “improvised scribblings” in manuscripts by Frescobaldi (see Jeanneret 2013); and the profusion of different versions of overtures and symphonies by Mendelssohn (see Hogwood 2013). What makes Variations’ – and numerous other examples of notation for improvisers – exceptional is that it was written in an era when textual autonomy is/was the normative view of notation. V. weave strips of gold-face paper through strings in space between bridge and fingerboard. fasten four colorful plastic butterflies to strings over gold paper. performing normal, “bartok” and/or “fingernail” pizzicati [sic], catapult butterflies from strings. Here I am faced with yet another quandary: how to approach the battery of objects required to perform the piece? The objects called for in Variations I-IV are fairly straightforward. A world map, pen or pencil, local flag, compass, toy whistles, animal or bird imitators or call, and clothespins are mostly utilitarian and/or sonically oriented, so I feel comfortable choosing the right tools for the job. However Variation V’s requirements seem more visual and theatrical. What is the role of the paper and butterflies; should they be big or small, flashy or modest, loud or quiet? Such questions grow in magnitude later in the piece, where Patterson calls for “Accordion bird […] Trumpet or sax” in Variation IX, “Parrot on string” in X, “Chinese drum” in XII, “eatibles” in XV, or “camel head” in XVI. Must I really bring an accordion? What sort of parrot and camel head does he mean – cardboard, stuffed, mechanical? Perhaps they were specific items in a personal collection? What on earth are “eatibles”? These inconsistencies and uncertainties accrue an additional layer of complication due to the difficulties of parsing compositional revisions from practical markups for performance. As I hinted above in my description of the “(Tuning)” problem in Variation III, one cannot always be sure if an annotation applies to an individual performance or to the piece as such. Omissions of parts of variations (e.g. “corrugated cardboard” in XI, or the final bars of Rigoletto scratched out in III, IX and XVI) or of entire variations (VII) are the trickiest case. While the intention is clear (“don’t play this”), graphical informality creates doubt as to whether Patterson set something aside on a particular occasion, or he meant to erase it from the composition permanently. In a few instances he does clarify that specific actions belong to particular performances (“Do this (“C claps” [sic]) Milan[…] Newcastle” in Variation VI), but this is the exception rather than the rule. Musicologist Bengt Edlund’s (1997) distinction between “structural” and “interpretive” elements in notation – those pertaining to the “composer as composer” (25) and the “composer as the first interpreter of a work” (25) respectively – seems to provide a useful tool to begin sorting out such chaos. Structural signs are “accorded normative validity” (25), whereas interpretive signs are “proposals that you are thankful for, consider – and feel free to ignore” (25). Edlund argues that this axis may help to liberate performers from indiscriminate compliance with each and every sign in the score; faithfulness to a particular semantic layer of the notation trumps faithfulness to the letter of the score as a whole. But as Edlund hastens to acknowledge, it is not always possible to separate the two categories, and his test is not particularly robust: “If a sign is really interpretational, it is likely that it can be disregarded, or that other signs can be substituted for it, with acceptable musical result” (1997, 26). In the context of Variations it is especially weak, for Patterson himself provides so many alternatives that hardly a structural sign would remain if we accept Edlund’s criterion of substitutability. Guitarist-scholar Stefan Östersjö’s critique is relevant here: “The problem with this line of thought is that it is typical of the two agencies that they overlap and are shared by both parties.” (2008, 86). Because Patterson was the piece’s foremost performer, the boundary of agencies is especially elusive. What all of this – conflicts between multiple annotations, historical and semantic ambiguities relating to Patterson’s handwriting, difficulties in determining types of agency and style – suggests is that Variations‘ notation simply does not benefit much from a textual view. We can, of course, find elements of prescription and preservation, but once a performer attempts to rely on them, contingency and possibility complicate the situation considerably. The local flag in this case is the German flag (or the flag of Köln)… a small one… maybe 10cm long, made of paper or cloth on a short pole. This is placed at/near the city where the performance takes place. Check the shops near/in the Bahnhof. About the Verdi: in general you can play the entire melody each time, OR play the entire melody only once… either at the beginning or at the end… and play only fragments of the melody at other times. This is your choice. On the other hand, the letter of the score is not arbitrary; Patterson clearly cares for the details of notation. This is true not only of Variations but also of pieces throughout his oeuvre.8 His specific wordings (and sometimes visually beautiful presentations) invite performers to treat seemingly mundane tasks with a heightened degree of conscientiousness, and they shift attention to possibility beyond surface. Variation VIII-3 is one such case: “roll narrow wheeled furniture caster slowly down from endpin over tailpiece, bridge, G string and into pegbox (caster may squeak).” He could have just as easily written “roll furniture caster from endpin to scroll”, and the overall effect for an audience would be roughly the same. But by articulating specific aspects of the environment in which the action takes place, the notation focuses each step, engaging the performer in a process of discovery that is, as his quote at the beginning of this chapter suggests, fundamental to playing Variations. In VIII-3, the particular trajectory of the caster is important not because it is structurally definitive (movement along the D string would not pose grave consequences), but because it articulates the context of the activity – where exactly the performer is at any moment, what unintended things may happen – and demands a deeper sort personal engagement. As we shall see later, proceeding from this attentive connection to the score does have practical consequences. Fortunately, these two apparently contrary impulses – to avoid getting carried away with the notation in and of itself, and to respect its details to the extent that they might spark a discovery that cannot be predicted before carrying out the work it sets in motion – can be reconciled by taking into account a simple historical fact: Patterson was the piece’s only documented performer until my performance in 2009. Because the double bassist and the composer were one and same person, there was no need for Patterson to finalize, clarify, or document all revisions and performance notes systematically for other eyes. As the score was not published until twenty-six years after it was written, we can safely assume there was no great incentive for the composer to eliminate inconsistencies that he could have ignored or dealt with himself when necessary. The map does not tell you where things are, allowing you to navigate from any spatial location you choose to any other. Rather, the lines on the sketch map are formed through the gestural re-enactment of journeys actually made, to and from places that are already known for their histories of previous comings and goings. The joins, splits and intersections of these lines indicate which paths to follow, and which can lead you astray, depending on where you want to go. They are lines of movement. In effect, the ‘walk’ of the line retraces your own ‘walk’ through the terrain. According to this model, Patterson’s handwritten addenda are not refinements or repairs to a completed work, but paths that trace “journeys” he “actually made” as a performer through the initial typewritten sketch. What I previously characterized as inconsistencies or points of notational conflict are the “joins, splits, and intersections” of those paths, through which Patterson improvised new routes and began new trajectories. The complex layers of editorial chaos represent a continually fresh re-tracing of germinal ideas over time within and in response to his personal history with the piece. In sum, the score becomes a space for ongoing intervention. As the score “makes no claim to represent a certain territory” (Ingold 2007, 84) – to prescribe and preserve the definitive content of the work – Patterson’s lines can be understood as contingent, but exemplary. The metatext here is an invitation to other performers to continue intervening and drawing their own lines rather than untangling Patterson’s. This view is bolstered when we consider that Patterson deliberately offered me his personal palimpsest instead of a clean copy of the original typewritten score (sans handwritten annotations, Verdi, etc.) as published in the Fluxus Codex (Hendricks and Pincus-Witten 1988) or in Patterson’s event score catalog (Stegmayer 2012). My case is not an exception; right up until his recent death, Patterson continued to offer the Black and White File edition to people who requested the score,10 thus proactively inviting others to participate with him in this “conversational product of many hands” (Ingold 2007, 85). You are on center stage… in the spotlight… performing “Variations for Double-Bass”, as best you can. At the far right (or left) of the stage, “the composer”, sitting on a chair… in dim light…, “critically” watches and listens to your performance. In the end, of course, “the composer” is very happy and applauds your performance… MIGHTLY [sic]! Patterson’s caricature of the overbearing “composer” here is revealing. By reinserting himself into the piece in quotation marks, he confirms what we have suspected all along: that the act of composing Variations is a performance. This self-satire deconstructs Patterson’s position as author, “interrupting the working of the work congealing into a work” as philosopher Gary Peters (2009, 94-95) would put it, and thereby unfixing the (already barely fixable) text. In so doing, Patterson definitively deflates the scriptocentric view through which I began the present analysis and reminds us that in the sketch map of Variations, “[w]hat count are the lines, not the spaces around them” (Ingold 2007, 85). But the new variation is not merely ironic metacommentary. Patterson’s “funny idea” is also a new line itself, material to be realized in concert. Beyond the veil of the work-as-noun lies work-as-verb; “performance” is both an act of role playing and an act of hands-on musical labor. (This must have been all too clear to the composer during the thirty-five or so years in which he was the only bassist to play the piece.) The importance of this aspect of Variations recalls Patterson’s ambivalence toward notation: “In fact, any piece is just this: a person, who, consciously, does this or that” (Lewis 2012, 988). Granted, this new line is not entirely like those he applied to the printed score. As one can see in the video of my 2009 concert included here, the “composer” variation does not entail much in the way of action; Patterson observes from the corner, with modest facial expressions and a brief tuning parody on his miniature instrument. There is a stark contrast between his passive stance and the explicitly physical work in which I am engaged with the bass and other gadgets. However the new variation does share with all the lines on the sketch map a commitment to perpetual transformation. Patterson’s edits place the material in situations where its identity may not only altered, but completely rediscovered in the act of playing. Regardless of the level at which this occurs – at the position of C-clamps or the ontology of the work – the sheer relentlessness of this commitment seems to be at least as important as the material that he re-composes. Taken together, these line-events of the inscriptive performance, I would argue, themselves constitute (an) improvisation. To move from the assertion that the score is a performance, to the assertion that it is an improvisation, may require some additional explanation. The first apparent problem with this formulation is that most standard conceptions of improvisation, for all their differences, locate improvisation in the event of playing (see Chapter 0, “On and Through a Name”). I wholeheartedly agree, and for this reason have emphasized the role of players in the life of scores, “on how improvisers use notation, rather than on the internal structure of the documents themselves”, throughout Tactile Paths. Thus, in Chapter 0 I criticize composer Pedro Rebelo’s (2010) discussion of his realtime computer-generated notation for omitting the factual contingencies of performance. Likewise, my discussion of the visual aspects of Cornelius Cardew’s graphic score Treatise in A Treatise Remix Handbook is as parsimonious as possible, in contrast to numerous other analyses of the piece (cf. Dennis 1991; Ashwal et al 2001; Anderson 2006). What is the logic and the purpose, one may ask, of focusing on the score of Variations as a site of improvisation – particularly since it never once asks the performer to “improvise” as such? I would explain my use of the term as a further emphasis on the practice of notating, as opposed to the work-as-noun that notated artifacts, in the form of a score, are often understood to construct. Indeed I sympathize with philosopher and musicologist Bruce Ellis Benson (2003), Östersjö (2008), and pianist and artistic researcher Paolo de Assis (2013a), who all claim that musical works – which consist not only of manuscripts, but also editions, ongoing performance histories, recordings, discourse around the piece, and many other factors – are, like Variations‘ notation, processual. I also recognize that improvisation in, on, with, around, and through works is a fundamental part of their existence. However works are not practices in and of themselves; they are ideations, whose existence depends on a much higher order of complexity than I wish to address here. My goal is to focus on the lower level context of notation, how composer-improvisers work with it locally, in order to provide other performers with entextual alternatives to the work-based model. Clearly Cage’s influence ca. 1962,11 as well Stockhausen’s (for whose tutelage in tape music Patterson had been initially drawn to Cologne (see Russeth 2016)), do not suggest a particularly improvisational bent. Nor does Variations’ self-evident debt to Patterson’s background as an orchestral bassist. For these reasons alone, one might conclude that Patterson’s relationship to improvisation at the time was tangential, at least in comparison to the rest of the composers included in Tactile Paths. XVII. address, write message (reading aloud) and stamp picture postcard. post in f-hole. To be sure, such a moment could hardly be less Cage-like: demonstrative, communicative, embodied – in sum, an unabashed “exercise of taste and memory” (see fn. 11). Although he may have begun the piece with Cage in mind, Patterson emerges here as the polar opposite to Cage’s puritanical emphasis on objectivity, discipline, and a stark separation of musical material and the body (see McMullen 2010). Suffice it to say, then, that Variations does not fit squarely into a post-Cageian (i.e. hypo-improvisational) tradition. It is in this sense above all that I consider Variations’ notation to be an improvisation: a “meta-improvisation” entextualized by, but not reducible to, the composer’s ad hoc markings and the temporal conditions under which he applied them. Patterson’s wayfaring consists in his movement through the piece as he wrote and performed and rewrote it time and again, not in the printed page alone. At the same time, the printed page must be understood as part of the movement, for it not only records previous trajectories, as skid marks on a highway never to be revisited by the driver who made them. It becomes an actant within Patterson’s environment – what Ingold calls “the country” (75) – accumulating and reflecting those trajectories back to Patterson as he continues forth. To bring these threads together, I surmise that there is no clearly determinable point at which Patterson’s notation ends and his performance begins. The narrative of Patterson’s actions embedded in the score and the actions themselves are “complementary strands of the same performance” – a decades-long improvisation. To people who have not performed the piece, or in Ingold’s words, “outsiders” (2007, 76), this continuity may not be easily identifiable. But for me, a performer, it is key to understanding the piece, for it compels me to “recursively [pick] up the threads of past lives” (Ingold 2007, 90) and improvise myself. Characterizing the score as an ongoing process of improvisation, rather than merely a document from which that process originates underscores that performers are far better served by emulating the reflective and experimental attitude traced in the notation, than by copying Patterson’s factual historical choices. For my own performances of Variations, this has had foundational consequences. It has brought liveness and significance to preparatory work I would not ordinarily consider “performative”. That work, a “blurring of art and life” in the words of proto-Fluxus artist Allan Kaprow (Kaprow and Kelley 2003), has in turn shined a light on what exactly Patterson means by the “personal value that the participant himself perceives about his own behavior and / or that of the society during and / or after the experience” (Lewis 2012, 988). Furthermore, it has shown how the acts of perceiving oneself and society can become blurred in the improvisation of daily life beyond the stage. In the rest of this chapter I will attempt to unpack specific examples of this from my own experience. The first and most basic task of preparing Variations is assembling the long and sundry list of objects required to realize Patterson’s instructions. On paper, the relationship of this task to the “artistic” work of interpretation and performance appears to be purely “instrumental”. Although it is an important part of the production of a musical experience, one might reasonably presume that it has no more musical significance than rehairing a bow or setting up chairs for a concert. However in practice, most objects have to be actively procured, and the score provides minimal context for determining their qualities, functions, and probable source. The process of filling in this context can be a complex one indeed, particularly if one accepts Patterson’s invitation to “recursively [pick] up the threads” (Ingold 2007, 90) of past performances and continue improvising. Objects such as “C” clamps, the “chain” pulled through the F-hole, or styrofoam are (also) sonic in nature. The size of the clamps, the length and materials of the chain, and the shape and sort of styrofoam will all have a direct impact on the character of the variations that involve them. But the score presents neither indications as to the objects themselves, nor to the duration, intensity, or affective character of events that might provide a clue to the identity of these instrumental prostheses. On what basis, then, shall the performer search for and select them? Some objects have the potential to function both visually and sonically, depending on the particulars of what the performer collects. Gold face paper, for instance, can be solely a decoration that dampens the strings; in that case, one might choose a thicker, softer card stock. On the other hand, it might be used as a preparation that audibly rattles when the strings are plucked; in this case a thinner, metallic foil-like paper would be appropriate. Similar questions can be asked of the butterflies and mechanical bird: should they be selected for their decorative appeal, their qualities as musical instruments, or both? On the surface these issues bear a strong resemblance to interpretive problems in Cage’s music for prepared piano, which initially inspired Patterson to write Variations. Pianist and artistic researcher Luc Vaes has pointed out in his exhaustive study on the “extended piano” (Vaes 2009) that the preparation instructions included in Concerto for Prepared Piano and Orchestra or Sonatas and Interludes leave considerable doubt as to the material qualities and placement of preparatory objects. Cage does indeed offer a detailed inventory of the screws, nuts, weather stripping, and pieces of rubber placed between the piano strings, as well as “exact” location coordinates in the form of string names and absolute distances from the bridge. However structural differences from instrument to instrument in string lengths and thicknesses relativize his prescriptions considerably. The performer cannot rely on the letter of the score alone; in choosing preparation objects and locations, she must ultimately exercise taste and judgement, adapting to local contingencies. But whereas in Cage’s case, the foundational context of the performer’s search for objects is found ultimately in the melodic, rhythmic, gestural, and textural scaffolding represented in the conventional notation, Variations offers no such fallback; the instructions are the score, and they are thin indeed. As I noted earlier, basic information regarding the affective character of actions and timing are nowhere to be found. The performer can almost never rely on the letter of the notation to answer the questions I asked above. How, then, is she to go about assembling her instrumentarium? I would posit that rather than presenting “instrumental” hurdles to overcome, these problems constitute a fundamental site of creative work in Variations. If the performer approaches these questions as opportunities through which to discover her own context, without undue emphasis on immediate results, they engage her in precisely the same sort of pre-performative improvisation that Patterson himself traces in the score. Just as exploring the mechanism of “preparations” on the contrabass brought the composer “to consider the instrument in itself, as an object or a medium that could be handled in a theatrical way to broaden the range of audio and visual ‘image-effects’”, so are other performers brought to reconsider their practices and Patterson’s notation by exploring the mechanism of “preparing” Variations in the broader sense. Like Methods and Processes, Variations “gives a limited set of instructions as to how […] interaction is to be performed” – in this case with objects and the places where they might be acquired. Performers of both pieces must “engage with the country” (Ingold 2007, 76) in order to determine the terms of that interaction. In this way, questions about the nature of the objects in Variations may answer themselves through a process of ad hoc hunting and gathering. Hardware, craft, party favor, book, and magic shops; flea markets; random junk piles on the street; closets and kitchens; and the giveaway table in an old East German cafeteria have all been my “instrument shops”. The roles and ideal qualities of objects have often emerged and accrued meaning dynamically through my interactions with such locales and their unexpected offerings. One such case is the world map in Variation I. For my 2009 and 2014 performances, I used a modern National Geographic map of the earth that had previously been hanging in my hallway. “World = planet Earth” was my common-sensical interpretation. I might have used this map forever, had I not encountered a map of Pomerania nestled among a stack of free books at the above mentioned cafeteria in the former East German town of Jena shortly before a 2015 performance. Unfamiliar with the geography and history of Pomerania12, I opened the map and was surprised to see Berlin at the lower margin of the area represented. (Most modern regional maps of northeastern Germany feature Berlin prominently.) I was charmed by this marginality; the idea of Berlin, where I would perform the piece, sitting on the edge of “the world” seemed a poetic fit to the context in which I would perform the piece, a Fluxus festival at a state opera house — another “edge” of another “world”. While this joke was likely lost on the audience in the performance, it was a source of personal enrichment for me: precisely “the personal value” that Patterson underlines, but happening before, rather than during or after, the action onstage. In addition to searching alone, I have also engaged with shopkeepers and friends in peculiar and refreshing ways in order to find these objects. Drawing on the depths of a magic shop clerk’s knowledge of her toy butterfly assortment; enlisting the help of friends to dismember and modify stuffed animals; or chatting with Patterson about the objects he used in his own performances (one of which, the mechanical parrot, I have inherited) have of course formed part of my concept of the objects’ identities. An example of this phenomenon concerns the butterflies in Variation IV. In the process of launching them onstage, I invariably lose one or two. After two performances of Variations in 2009, the set of metal butterflies I had carefully picked out at a magic shop in Barcelona — for the brilliant “clang” they made upon crashing to the ground, and the clips behind their wings that allowed me to lightly clamp them to the strings — were mostly broken or lost. At the time of preparing my next performance in 2014 and wondering how to replace the missing objects, I discovered that a friend of mine had adopted one the butterflies I launched and lost in the second of my 2009 performances. Because we did not know each other in 2009, I was surprised to learn that he had kept it as a memento. He offered to loan it to me for my performance in 2014, on the condition that I take good care of it and return it to him afterward. I obliged, and we repeated the procedure for my next performance in 2015. Through this exchange, Variation IV has become a ritual of friendship as well as an instruction, changing my relationship to the butterflies en route. In these examples, which are but two among many, notation elides the constructed indeterminacy of performance with the ineluctable indeterminacy of life. The acquisition of objects spins out into a more fundamentally human kind of improvisation in and with the world in which “the traveller” – I – and my “line” – practice along but not merely within the piece – “are […] one and the same” (Ingold 2007, 75). Those elisions shine a light not only on the “personal value” Patterson states to be the objective of performing Variations, but also on that personal value’s intimate connection to community, or the behavior of “society” as Patterson puts it. The mapmakers of my prop for Variation I, the politicians who drew the borders around Pomerania, and the cafe owners who curated the giveaway table where I found the map all became active partners in the improvisation of realizing Variations. So did friends who helped me (dis)assemble stuffed animal heads (which, incidentally, were never used in performance) or rescued and babysat my lost butterflies. Likewise one can imagine how clerks or customers standing in line at the bakery where a performer of Methods and Processes enters and smells (and receives looks of befuddled amusement) also become part of a shared experience. Perhaps the most poignant example of this unexpected collectivity is Patterson’s new variation for my 2009 performance – or shall I say our performance – in which we literally perform together. Once at least some of the objects are at hand, the work of actually playing the piece can begin. How does it carry forth the line of notation, investigation, and preparation explored thus far? Up to this point in the text I have developed an entextual view of Variations by abductively examining the granular content of the score, the historical context of that content, the instructional value of the context, and the beginnings of a performer’s work. This sequence comes reasonably close to representing what, in my experience, a critical performer might deal with when finding her way through the piece. Following my previous comments about the continuity between Patterson’s notation and performances, one might say that in this text, too, “the thread being spun now and the thread picked up from the past are both of the same yarn. There is no point at which the story ends and life begins” (Ingold 2007, 90). But when I attempt to describe and situate the later steps of playing, refining, and combining individual variations on the way to concert presentation, a linear approach becomes less tenable. My objects, notes, and video documentation from several performances of Variations have many gaps and messy intersections between those steps. Rather than a single winding line, I see something more like the unperformed score of Variations, as viewed by an “outsider”: a cacophony of footprints and fragments which trace a theoretically continuous movement, but which are themselves extremely discontinuous. The lines of this sketch map are radically different from, for example, the seamless calligraphy of Malcolm Goldstein’s Jade Mountain Soundings, which indexes unbroken movement across the page, to be read with unbroken concentration by the performer, and representing unbroken lines of sound in performance. As I have attempted to demonstrate thus far, making sense of the sketch map and construing Patterson’s movement through the piece – which, I contend, is the score’s real meaning from a performer’s point of view – both elicits and depends on the active improvisational performance of the “reader”, the performer. By going forth without all the answers, learning through action, a performer not only discovers what Patterson did historically, but also that the piece “is just this: a person, who, consciously, does this or that” (Patterson, as quoted in Lewis 2012, 988). In the spirit of this assertion, and in an effort to finish unpacking my preparation of Variations with a modicum of honesty, I would like to scribble on my own sketch map. Rather than continue as before, I will henceforth trace “pieces” of my experience of rehearsing and performing Variations in the form of seventeen meta-variations. These reflections and instructions for actions are meant for the reader, to perform herself. By “perform” I mean two things. The first sense refers to actions that the reader is encouraged to realize literally, paying close attention to the empirical particulars of the process. I intend these as analogs of the preparation process that I have gone through myself in Variations, in order for “outsiders” to experience a taste of this themselves. Hopefully, doing so will act as a “preparation” for viewing the videos of my performances of the piece, transforming the reader’s viewing and enticing exploration of contingency in the way that placing objects on bass strings does. Sometimes the work moves quickly, in a linear fashion, as for example in Variation I. I figure out how to unfold the map, make sure the compass is functional, and place both objects on the floor in order. The local flag presents a slightly higher degree of complexity, in that I must decide how and where to display it. In all my performances I have placed the flag on the ground by default – this is a personal decision, rather than a given – but have used different techniques to support the flag on each occasion. The 2009 performance features a small empty jar; the flagpole leans against the lip of the jar, and the flag droops downward. In 2014, I might have dedicated more time to this question, as my use of Blu-Tack clearly failed and the flag fell down repeatedly. In 2015 I used a small jar filled with earth, and stuck the flagpole in it upright. Ironically, Rzewski employs this observation to define the differences between notated composition and improvisation, but in Variations, we see how this principle in fact undoes the distinction completely. In contrast to previous stages of picking through the notation and assembling objects, which proceed bit by bit at the most pragmatic level possible, I often begin the rehearsal process for a concrete performance by surveying the variations as a group and considering which ones to play in which order. Although the letter of the score neither requires nor permits mixing and matching variations to taste, both the performative diary embedded in Patterson’s edits and our direct correspondence, as described above, provide more than sufficient encouragement. This adds an additional layer of complexity to the already considerable work of sorting through what Kotz terms the score’s “maximal availability” (2001, 80). However it provides a way to cope with immanent risk of tedium involved in playing each and every variation in the written order. 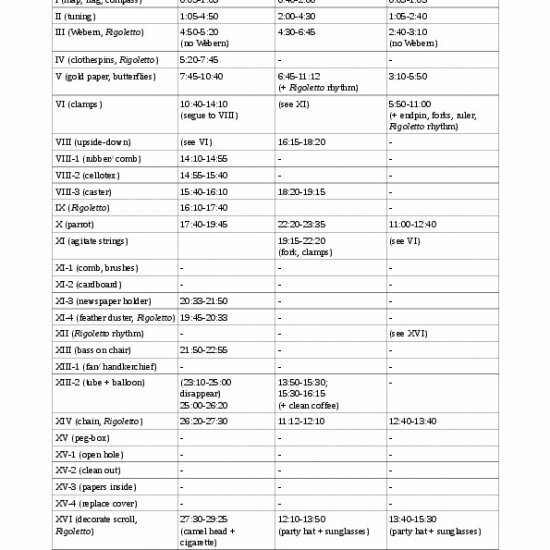 A viewer can sense this risk – if not the tedium itself – in my first performance in 2009, which contains almost every variation in the sequence given by Patterson; the total duration is 30:05. In comparison to my performances in 2014 and 2015, lasting 24:30 and 17:05 respectively, the shape of this first performance comes across as rather arbitrary. Indeed one may have the impression of an undifferentiated list of circus tricks rather than an integral piece. The danger here is not merely boredom or exhaustion, but rather that Variations may come across to the audience as a cheeky 1960s period piece rather than a living, ongoing improvisation. For other variations, the work can be slower and the path less direct. Different clamps (VI) and clothespins (IV) at different locations on the strings, for instance, create completely different sonorities, so these variations require more “conventional” musical practice and deliberation than an object such as the flag. The score also declines to indicate how many preparations should be employed, whether to play these variations arco or otherwise, and other such details of the operation. In order to develop a sense for the possibility of particular tools and techniques in these variations I try out as many possibilities as seem worthwhile, and become aware of other variables in the process. 2009: “The composer” seemed delighted at my “removal” of the clothespins in Variation IV (7:42). Do you like it? If not, place a number of wooden and plastic spring-type clothespins on your fingers. Do you like it now? A dramaturgical priority of mine is to choose forms that foreground and partake of that living, ongoing improvisation. For example: improve upon previous performances (hence my reflection after the maiden voyage in 2009). “In what sense might improvisation prove to be a sort of ‘improving’?” asks Benson. Rest. Refuse to fly. Visit an old friend. The moon is a great piece of cheese: two eyes, a nose, and a mouth. Can you do this? Do this here. There. Both positive and negative improvisation overlap as I learn the idiosyncracies of the object and adapt my “performance” to its capabilities. This negotiation can activate parameters that have nothing to do with the parrot itself, such as the physical position of the instrument, but that nonetheless draw attention to themselves in the process of exploration. As improvisers are wont to do, I welcome such developments and follow their trajectories in both rehearsal and performance. One may compare in the videos how I have physically oriented the bird, my instrument, and my body to each other in three completely different constellations to get the object to “work”. In 2009 (18:10-19:45) this dance came to dominate Variation X – my first encounter with parrot, immediately after Patterson had delivered it on the afternoon of the concert. I placed the bass on my lap and set the bird on the strings. Its torso moved front to back, but did not locomote, so I attempted to help it by raising the bottom of the bass and so creating an incline. This action turned into a theatrical gesture which I had not planned, but which anyway became part of the unfolding of the performance. 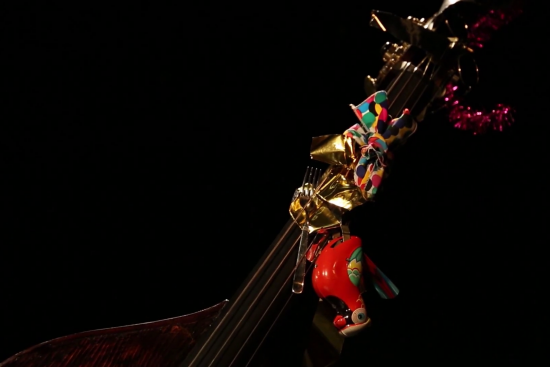 In 2014 (22:20-23:35) I had difficulties getting the parrot to move at all, and so resolved to move it with my hands around the bass lying on the floor. This activity became a kind of puppetry, as if the bird were investigating different parts of the instrument in order to find a place to make its nest. (Ultimately it decided on the gold paper.) In 2015 (11:00-12:40), I resolved to avenge the lackluster performance of the parrot in 2014 by practicing with the bird intensively. I carefully experimented to observe how its legs should be placed between the strings and how I could control miniscule differences in string pressure to activate the parrot most effectively. While the bird was decidedly more active in this interpretation than in 2009 or 2014, my fixation on success ironically prompted a rather mechanical quality of movement in my own body that detracted from the playfulness of the activity. That is to say, in this case I failed to follow the secondary parameter and the performance suffered for it. The 2014 performance was preceded by a day-long itinerant minifestival including pieces by Patterson and other Fluxus artists, many of which were 80th birthday gifts to Patterson. My response to this occasion manifested in two ways. As I was preparing my performance of Variations at the same time, my attention was naturally drawn to Variation VIII (“holding bass by fingerboard upside-down, balance on scroll”). I decided to include this variation in my performance as a gesture of continuity with Project; I was particularly sensitive to the way in which the bass should be inverted, which like most instructions is not defined in the score. Having practiced a dramatic technique for Hendricks’ piece, I resolved to employ this in Variation VIII, and inserted Variations XIV (11:12), XIV (12:10), and XII (13:50 before VIII (16:15) in order to make the bass raising more climactic. Two. I integrated party favors into the instrumentarium. In Variation II, while tuning (4:22), I used a party whistle as one of the “four different toy whistles, animal or bird imitators or calls, etc.” The object returns in Variation XIII (13:55), attached to a “flexible tube to which is attached a balloon” that sounds when the balloon deflates. (The balloon itself reads “80!”.) Instead of covering the scroll of my instrument with a camel head in Variation XVI, I used a party hat. Standing right-side up, yawn. Whistle happy birthday. There is of course more to the selection process than shuffling self-contained modules to embody a dramaturgical vision. As we have seen since the beginning of this analysis, the content of individual variations is extremely malleable and context-dependent. Thus, formal decisions always take place in a feedback loop with “lower level” practical considerations, where the material improvisation takes place. NOTE: The omission of Variation VIII in my 2015 performance was of course not the result of a single factor, the “chain problem”, but of a network of factors both internal and external to my own interpretation. For one, the piece was programmed in a tightly scheduled concert with other pieces, and I had to reduce the number of variations to the minimum. I also wished to focus on the sonic aspect of the piece more than I had in previous performances, for which reason VIII seemed superfluous. The attached copy of the score also contains my own markups, in pencil. Where are they? Indeed, my improvements of previous performances have not resulted in an ever sharper rendition of the same image, any more than Patterson’s edits to his score have. Rather, both Patterson and I have responded to “actual needs” to extract new “personal value” (Benson 2003, 150) from the piece. Thus, one finds a wide spectrum of forms in the three attached performances. In 2009, as I mentioned before, I played the piece for the first time, and the primary need was simply to get through the piece; most of the variations are therefore performed “as written”. After I discovered that the length, pace, and combination of variations in this maiden voyage were problematic, subsequent versions have all been shorter and more compact, but each includes different variations and orderings to reflect a slightly different focus. The 2014 performance, for example, which was programmed in a concert in honor of Patterson’s eightieth birthday, has a more theatrical, celebratory flavor in which variations are strung together dramatically with a climactic inversion of the bass in Variation VIII. My 2015 performance, on the other hand, has a more matter-of-fact sequence which is meant to focus on sound. There are fewer variations, allowing me to spend more time exploring the particular sonority of each individual section. 14 June 2015 was my thirty-fourth birthday, and also Flag Day in the United States. I wanted to present a robust, compact, sound-oriented performance. The 2014 performance felt a little too theatrical, or decorative. After performing it, I thought, “that is the best version I have ever played!” It was musical, but also stiff. Individual variations are of course just the starting point in practicing and putting together a performance. As soon as one follows through with all the stages necessary to realizing a given variation, one discovers the importance of transition: when and how the objects and preparations should be removed, where the instrument is placed, and so forth. If I choose to leave objects attached to my instrument, the bass can potentially accumulate paraphernalia until the end of the piece. Multiple preparations can enrich each other or cancel each other out; if I take them off, they can be placed neatly and methodically on the table whence they came, or thrown on the floor like cigarette butts. The significance of transition is especially noteworthy in Variation XIV, for the chain of junk that must be taken out of the F-hole must not only be dealt with afterward, but also installed inside the bass before the performance begins – preferably inconspicuously – and dealt with in the preceding variations. If I am to turn the bass upside-down in Variation VIII, this could compromise the security of the chain inside the instrument; thus I have to find a delicate way of maneuvering the instrument to prevent this from happening. In 2009 this was not an issue, as I had forgotten to install the chain before the concert – and ended up running backstage to do so at 23:10-25:00! In 2014 I bypassed the problem by placing XIV before VIII. In 2015 I declined to perform VIII altogether. Even the “clean” “original” copy of the score, without the historical layers of editorial markings, was always and remains a space for intervention. The sketch map drawings are simply a flag. You, the performer, determine if the score is a notation for improvisers. Throughout the dissertation I use the “-er” spelling of the word “improviser”. However I respect the alternate “-or” spelling in citations by others who choose this variant. Likewise I respect British spelling norms in citations, while adopting American English norms for myself. See Fluxus Festival neuester Musik http://www.hundertmark-gallery.com/videos.0.html. A microindustry of digital copyists who specialize in contemporary music does exist – see for example the firm Notengrafik Berlin (http://www.notengrafik.com), for whom I have occasionally worked as a proofreader. Such copyists are usually hired for well-funded orchestral or opera projects, and as such do not represent the norm. In any case, their method of typesetting, and the performer’s approach to reading the finished notation, is no different from scores are copied by the composer directly. Music that makes an outright poetic feature of conflicting performative indications would be an exception. Here I have in mind pieces such as Xenakis’ Evryali (1973) for solo piano, where the density of notes is physically impossible for the pianist to play in its entirety; late pieces by Morton Feldman that superimpose multiple time signatures – the rhythmic values of whose events do not always add up (see Feldman 2000, 141); and numerous pieces by Brian Ferneyhough and Richard Barrett (and even my Apples Are Basic) that layer details such as embouchure, bow position, register, dynamics, and expressive markings in nominally contradictory ways to achieve unpredictable sounding results. While these cases do not depend on handwriting per se, it is noteworthy that all of these composers have copied many of their manuscripts by hand. Patterson died on 25 June 2016, between drafts of this chapter. The question of his current and future “unavailability” to answer these questions becomes more complicated now; I have no immediate suggestions for how players might access such knowledge, other than reading this text, consulting other contrabassists such as Michael Duch and Damon Smith who have worked with Patterson, or conducting the kind of archaeological research I already characterized as “alien” to the piece. Be that as it may, for reasons I argue above, there are other (richer) ways to deal with Patterson’s score than by attempting a reconstruction. For those seeking a deeper analysis of the (hypothetically) dead composer’s significance to performance practice and culture more generally, see Kanno 2012. See Methods and Processes (Stegmayer 2012, 93-106) or Pages To Save Our Planet (266-272). Cage is often criticized for his dismissive view of improvisation (see Lewis 1996 and McMullen 2010). However, as musicologist Sabine Feisst has pointed out, “in the course of his career, his idea of improvisation underwent a considerable transformation” (2009, 48), and some of his later pieces such as Child of Tree (1975) incorporate improvisation quite transparently (if not always by name). Therefore one must be careful not to equate Cage with an anti- or hypoimprovisational perspective out of hand. Nonetheless, as reflected in his famous letter to Leonard Bernstein regarding Bernstein’s proposal to program an improvisation along with the New York Philharmonic’s 1964 premiere of Cage’s Atlas Eclipticalis, his attitude toward improvisation at the time he met Patterson was unequivocally antagonistic. The letter reads: “Dear Lenny, I ask you to reconsider your plan to conduct the orchestra in an improvisation. Improvisation is not related to what the three of us are doing in our works. It gives free play to the exercise of taste and memory, and it is exactly this that we [Cage, Morton Feldman, and Earl Brown], in differing ways, are not doing in our music” (Feisst 2009, 43). Pomerania, previously a part of Prussia, extends along the Baltic coast from Stralsund in Germany to Dansk in Poland. See http://sneakreview.tumblr.com/post/80691645368/performance-tour-11-mar-2014-fernsehturm for photographs of the event. From Pattersons’s Seminar II (Stegmayer 2012, 127). Auslander, Philip. 1999. “Fluxus Art-Amusement: The Music of the Future?” Art Papers 23: 30–35. http://uahost.uantwerpen.be/theso/perf/auslanderfluxus.pdf. Barrett, Richard. 2002a. Blattwerk. Suffolk: United Music Publishers. Benson, Bruce Ellis. 2003. The Improvisation of Musical Dialogue: A Phenomenology of Music. Cambridge: Cambridge University Press. Borgo, David. 2007. “Musicking on the Shores of Multiplicity and Complexity.” Parallax 13 (4): 92–107. Brecht, George. 1963. Water Yam. New York: Fluxus. Cage, John. 1975. Child of Tree. Edition Peters Group, Frankfurt/Main, Leipzig, London, New York. Conquergood, Dwight. 1989. “Poetics, Play, Process, and Power: The Performative Turn in Anthropology.” Text and Performance Quarterly 9 (1): 82–88. de Assis, Paulo. 2013a. “Epistemic Complexity and Experimental Systems in Music Performance 2013.” In Experimental Systems: Future Knowledge in Artistic Research, edited by Michael Schwab, 151–65. Leuven: Leuven University Press. https://issuu.com/me21collective/docs/assis_-_epistemic_complexity_and_ex. Dehlin, Erlend. 2008. “The Flesh and Blood of Improvisation: A Study of Everyday Organizing.” PhD diss., Norwegian University of Science and Technology (Trondheim). http://brage.bibsys.no/xmlui/handle/11250/148918. Dennis, Brian. 1991. “Cardew’s ‘Treatise’ (Mainly the Visual Aspects).” TEMPO (New Series) 3 (177): 10–16. doi:10.1017/S0040298200013516. Edlund, Bengt. 1997. “‘Sonate, Que Te Fais-Je’? Toward a Theory of Interpretation.” Journal of Aesthetic Education 31 (1): 23–40.doi:10.2307/3333469. Feisst, Sabine M. 2009. “John Cage and Improvisation: An Unresolved Relationship.” Musical Improvisation: Art, Education, and Society 2 (5): 38–51. Feldman, Morton. 2000. Give My Regards to Eighth Street: Collected Writings of Morton Feldman. Cambridge, MA: Exact change. Hallam, Elizabeth, and Tim Ingold, eds. 2007. Creativity and Cultural Improvisation. Oxford, New York: Berg. Hendricks, Jon, and Robert Pincus-Witten. 1988. Fluxus Codex. Detroit: Gilbert and Lila Silverman Fluxus Collection. Higgins, Hannah. 2002. Fluxus Experience. Berkeley: University of California Press. Hogwood, Christopher. 2013. “Urtext, Que Me Veux-Tu?” Early Music 41 (1): 123–27. doi:10.1093/em/cat006. Iyer, Vijay. 2004. “Navigation through Form: Composing for Improvisors.” http://www.americancomposers.org/improvise/iyer_essay.htm. Jeanneret, Christine. 2013. “The Score as Representation: Technologies of Music Book Production in Italy (1580s-1650s) and Their Editorial Implications.” In Early Music Editing: Principles, Historiography, Future Directions, edited by Theodor Dumitrescu, Karl Kügle, and Marnix van Berchum, 171–94. Turnhout: Brepol. Kanno, Mieko. 2012. “As If the Composer Is Dead.” Mortality 17 (2): 170–81. doi:10.1080/13576275.2012.675197. Kaprow, Allan, and Jeff Kelley. 2003. Essays on the Blurring of Art and Life. University of California Press. Kotz, Liz. 2001. “Post-Cagean Aesthetics and the ‘Event’ Score.” October 95: 55–89. Lash, Dominic. 2011. “Derek Bailey’s Practice/Practise.” Perspectives of New Music 49 (1): 143–71. doi:10.7757/persnewmusi.49.1.0143. ———. 2012. “In Search of Benjamin Patterson: An Improvised Journey.” Callaloo 35 (4): 979–92. doi:10.1353/cal.2013.0023. ———. 2014. “Benjamin Patterson’s Spiritual Exercises.” In Tomorrow Is the Question: New Directions in Experimental Music Studies, edited by Benjamin Piekut, 86–108. Ann Arbor: University of Michigan Press. McMullen, Tracy M. 2010. “Subject, Object, Improv: John Cage, Pauline Oliveros, and Eastern (Western) Philosophy in Music.” Critical Studies in Improvisation / Études Critiques En Improvisation 6 (2). doi:10.21083/csieci.v6i2.851. Östersjö, Stefan. 2008. “SHUT UP ‘N’ PLAY! Negotiating the Musical Work.” PhD diss., University of Lund. http://lup.lub.lu.se/record/1237422. Rebelo, Pedro. 2010. “Notating the Unpredictable.” Contemporary Music Review 29 (1): 17–27. Russeth, Andrew. 2016. “Ben Patterson, Cornerstone of Fluxus and Experimental Art, Dies at 82 | ARTnews.” http://www.artnews.com/2016/06/27/ben-patterson-cornerstone-of-fluxus-and-experimental-art-dies-at-82/. Rzewski, Frederic. 1999. “Little Bangs: A Nihilist Theory Improvisation.” Current Musicology, no. 67/68: 377. Schuiling, Floris. 2016. “The Instant Composers Pool: Music Notation and the Mediation of Improvising Agency.” Cadernos de Arte E Antropologia 5 (1): 39–58. Silverstein, Michael, and Greg Urban, eds. 2016. Natural Histories of Discourse. Chicago: University of Chicago Press. Accessed August 6. Stegmann, Petra, ed. 2014. Benjamin Patterson - Sneak Review. Potsdam: Down with Art! Stegmayer, Benedikt, ed. 2012. Ben Patterson - Event Scores. Berlin: Verlag für Zeitgenössische Kunst und Theorie. Stoessel, Jason. 2013. “Scribes at Work, Scribes at Play: Challenges for Editors of the Ars Subtilior.” In Early Music Editing: Principles, Historiography, Future Directions, edited by Theodor Dumitrescu, Karl Kügle, and Marnix van Berchum, 49–75. Turnhout: Brepol. Vaes, Luc Paul Frank. 2009. “Extended Piano Techniques : In Theory, History and Performance Practice.” PhD diss., University of Leiden. https://openaccess.leidenuniv.nl/handle/1887/15093. Whitehead, Kevin. 1998. New Dutch Swing. New York: Watson-Guptill Publications. Xenakis, Iannis. 1973. Evryali. Paris: Salabert. Young, La Monte, ed. 1963. An Anthology of Chance Operations... New York: La Monte Young & Jackson MacLow.